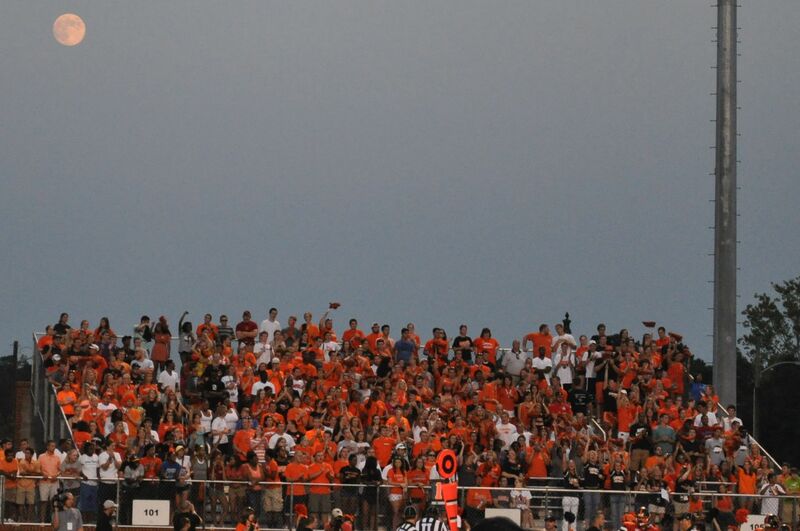 The proud sea of orange! As I rode through Buies Creek coming back from an event out of town, I was met with a sight that filled me with pride–lights and a sea of orange. The football field was lit up in bright lights for the second game of the season and showcased fans dressed to support thier Fighting Camels. It was definitely a sight that could not be missed riding down 421 HWY. The night was a special one as it was Military Appreication Day at the game. Veterans and those with military ID recieved two free tickets for the game. It was a little way to say thank you to those who serve our country. Thanks to them, we have the freedom to do much, including watching football. A special halftime show was performed with drills. “I enjoyed the halftime show because it reminded me of the drill that I did in JROTC in high school. I also enjoyed the pledge that was made by the ROTC because of the honor and commitment it takes to take the pledge,” said Nicole Fitzgerald, Social Work sophomore. What made me even more proud than the sight of Campbell excitement was when I learned we won against Virginia Wise Cavaliers 10-0! Now that is good news–the first win of the season! I only wish I could have seen it for myself! From that field of orange, though, Campbell was well supported even though rain was present. Go Camels!